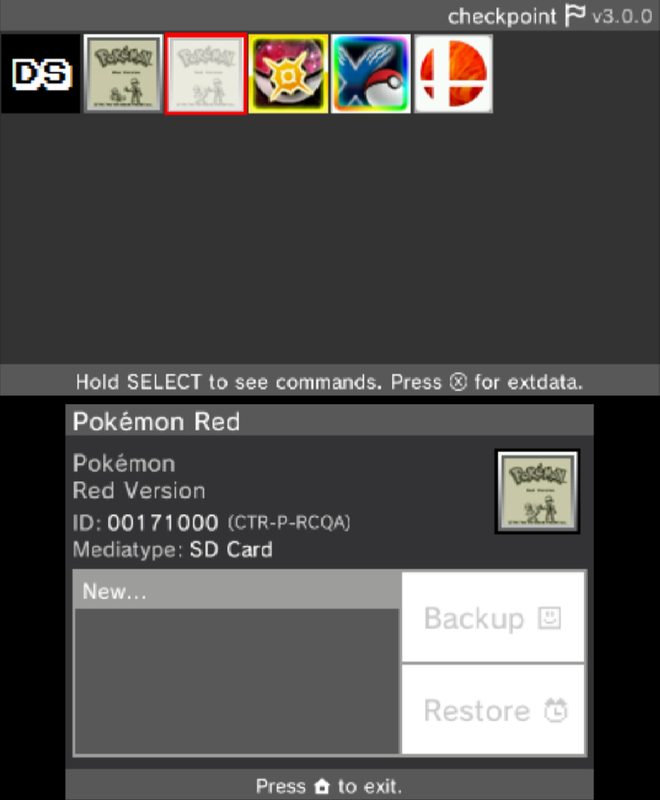 Checkpoint is a 3DS homebrew application that can backup and restore save files for 3DS cartridges, 3DS eShop titles (including GB and GBC virtual console), and NDS cartridges. This tutorial will walk you through its installation and usage. In order to use Checkpoint, you will first need access to CFW. A comprehensive guide on how to set it up can be found here. If you do not have what you need, you cannot use Checkpoint. The latest version of Checkpoint. A mirror of the CIA version can be found here. A mirror of the 3DSX version can be found here. If your CFW is Luma 3DS, then Rosalina makes it possible to use the Homebrew Launcher as an alternative to the CIA version. You cannot use Checkpoint with the Homebrew Launcher without Rosalina's Homebrew Launcher. Download the CIA version of Checkpoint and put it on your 3DS's SD card. 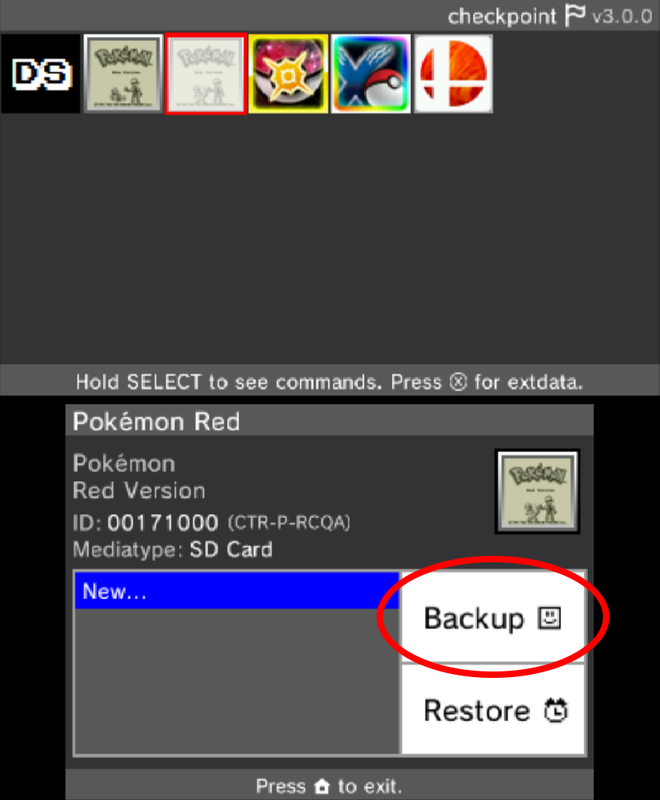 Once you have installed Checkpoint, these steps will guide you through backing up and restoring save files. Once complete, any saves you back up will be located in /3ds/Checkpoint/saves on your 3DS's SD card. 1. (If you're backing up a cartridge save and not an eShop title) Insert your cartridge, and make sure the 3DS menu can see it. This is important because sometimes the system can't read the cartridge unless it's inserted just right. 3. 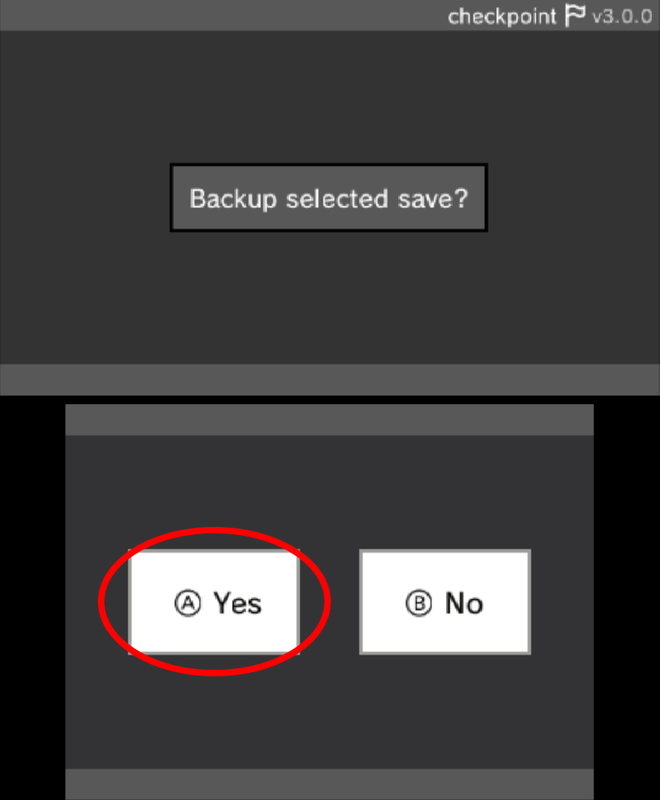 Use the DPad to select the game whose save you want to backup or restore. Then press A to select the game. 4. Use the DPad to select the save slot you wish to use (the selected slot has a blue background). If backing up the save, you can select "New..." to create a new slot. Be careful not to overwrite anything important. 5. Press either the Backup or Restore button on the touch screen. 6. Press "A" to confirm. 7. 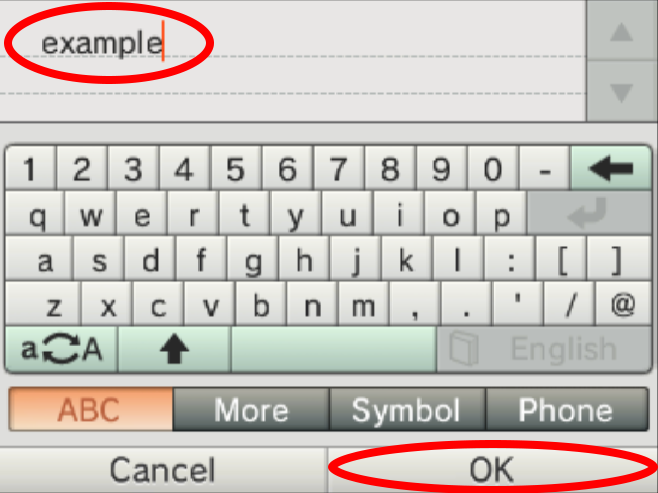 If you chose to create a new save slot, use the on-screen keyboard to give it a name, then press "OK". 8. If the save was exported correctly you should see a success message appear. 9. Your backup is complete. 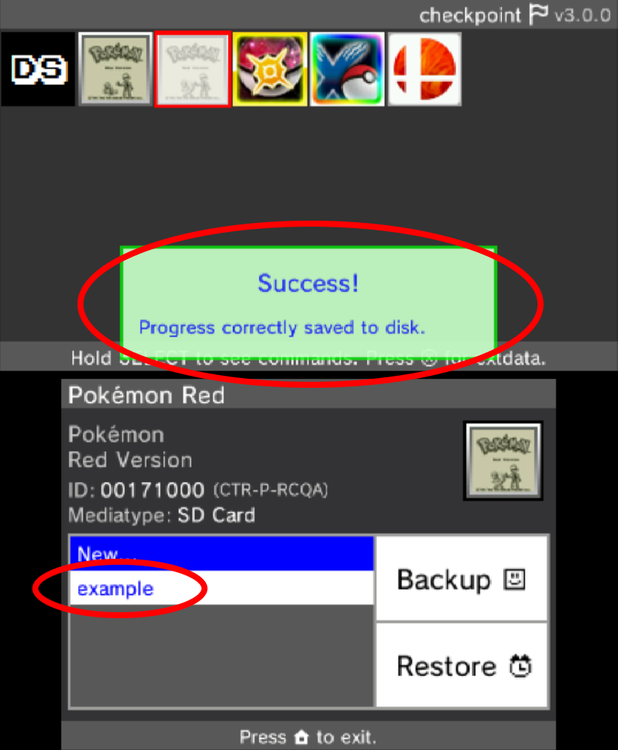 Exit Checkpoint, and your save should be located on your SD card under /3ds/Checkpoint/saves/(your game)/(your save slot). 10. MAKE A BACKUP OF THIS FILE BEFORE USING OR EDITING IT WITH ANY SAVE EDITORS. Credit to @NinFanBoyFTW for the screenshots. Thanks, for the post I actually figured this all out by myseld last night and now trying to figure out how to exactly inject the PKhex files, as well as poke edit (the website) files. 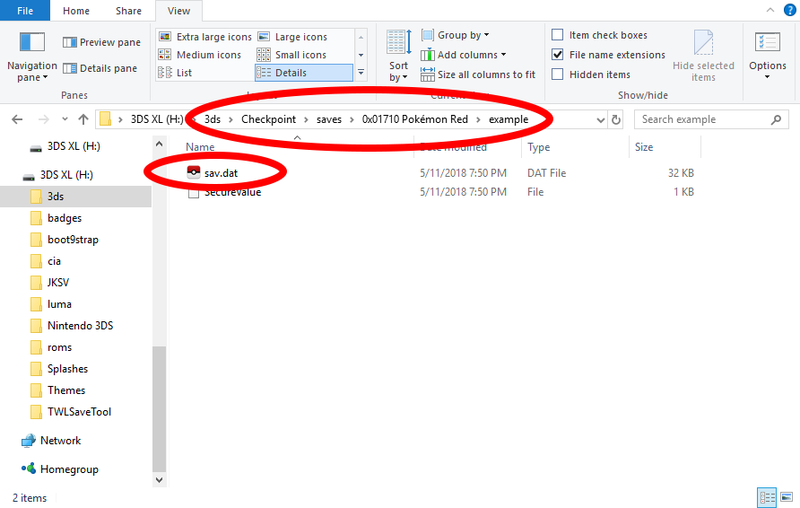 Wondering if I can inject pokemon into 4th Gen specifically Pearl and Platinum, specifically Poke Edit's files as they are older, aslo they have download of what seems to be the entire game. Idk need to look into it more. Also XY and ORAS I have all 4 and and under the impression you cannot attach items in XY? or you can it just doesn't look 100% legit but nobody would know if your just doing this for you self and maybe trade later? I wish Black and white and even the DS gen 4 games could link, the original games can link via the cored why shouldn't they beable to via wirless, should be an easy update to wireless component you would think. I guess just figure out thwere exactaly to put the files, because I can't imagine just dropping them in the dave and they are their? Or how to edit a pokemon already in your save? Not to worried about that but the knowledge can't hurt. Off to research, amd find a file with every event pokemon.